This sign is located at N41 51.648 W80 56.948. Eddie’s Grill is a Geneva-on-the-Lake institution. It also is a poster child for the American Dream, not to mention hard work, family, good food and fun times. 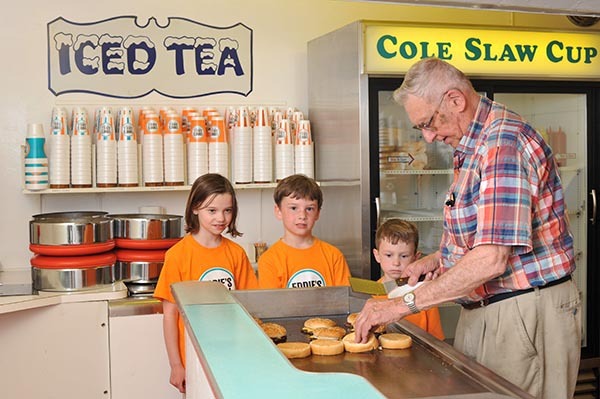 Founder Edward “Eddie” Sezon was a junior in high school when he wrote to the Richardson Root Beer Corp. and requested information on their franchise. 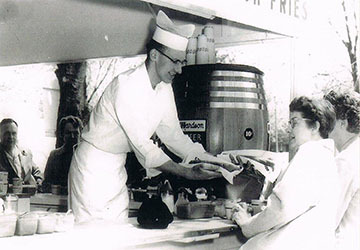 Eddie, who had spent his summers on The Strip since age 12, was interested in opening a root beer stand in the resort. He studied the information, figured out a way to build a stand and borrowed some money from his parents, Slovenian immigrants Frank J. and Mary K. Sezon. 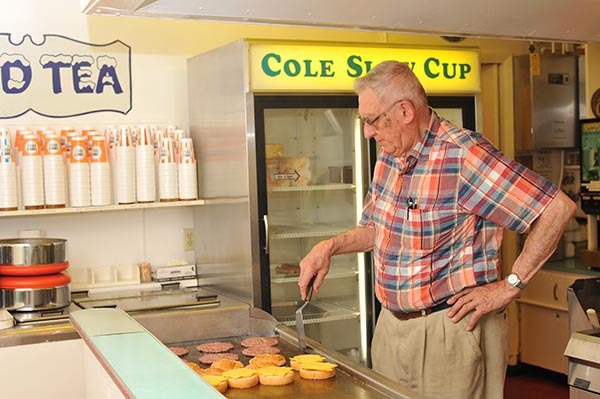 When Eddie’s Grill opened in the summer of 1950, he had only root beer, shakes, French fries, hot dogs and cheeseburgers on the menu. In the decades that have followed, the menu grew, but not by much. On the grill side, he added Slovenian sausage and a fish sandwich. 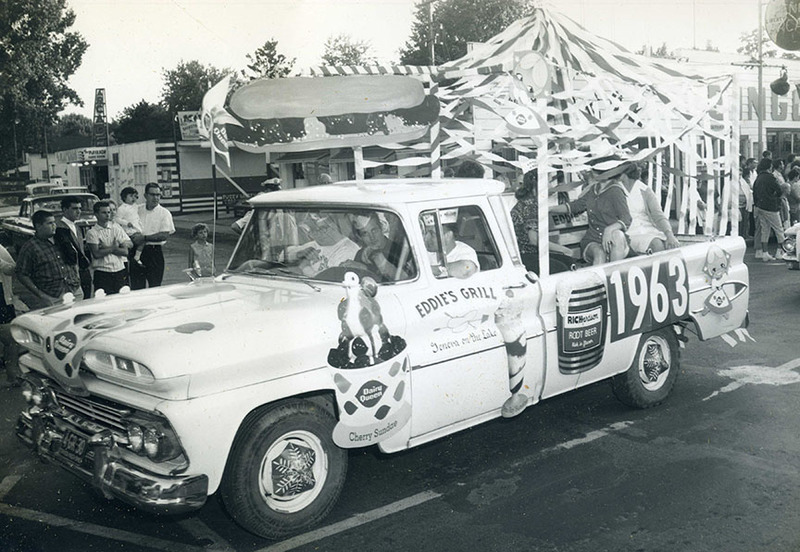 A Dairy Queen franchise, added in 1952, provides the full slate of sweet dairy treats associated with the brand. Bottom: Eddie Sezon still enjoys working at the grill and interacting with customers “I don’t really look at it as work,” he says. The atmosphere is 1950s, right down to the juke box speakers and the simple but functional tables. Cleanliness, careful attention to property maintenance and consistent quality in the food are hallmarks of the business. Eddie’s trivia: The chili dog sauce recipe was created by Eddie’s mother, the late Mary K. Sezon, who worked the grill right up until her passing in 2002. Eddie and his wife Anne continue to run the business, with help from Eddie’s sister, Rose Marie. Daughters Mariane Sezon Dana and Jennifer Sezon Brugger assist whenever their home and work schedules allow. The restaurant hires local youth who learn to work hard and provide excellent customer service. In any given summer, about 75 percent of the staff worked for Eddie for at least one prior season. This practice of hiring back the experienced crew helps the owners get the grill up and running each spring, on Mother’s Day, without having to retrain a whole new group of workers. Taking a break at the family restaurant are members of the Sezon family, who own and work at Eddie’s Grill at Geneva-on-the-Lake. 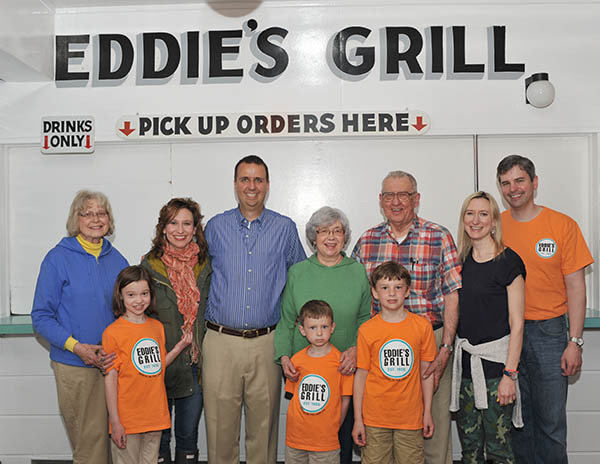 In the front row are Ellie, Harrison and Graydon Brugger; back row (from left) are Rose Marie Sezon, Marianne Sezon Dana, Richard Dana, Ann and Eddie Sezon, and Jennifer and Garett Brugger, of Erie, Pa.
Eddie Sezon still enjoys the hands-on work of running the grill and interacting with customers.Edward Sezon cooks the first burgers of the 2014 season as his grandchildren (from left) Ellie, Graydon and Harrison Brugger look on. Eddie’s Grill was started by Sezon in 1950 and has become a landmark on The Strip.